The team at The Linklater Center for Voice and Language are available to work with you in private sessions or with your company in a group Public Speaking for Professionals workshop. In this session we can share some of the theater techniques and experiences that will support your public life on stage communicating with an audience. The demands for an actor are similar to those required of a leader, who must communicate with purpose and passion. Acting and leadership both require confidence, creativity, empathy, imagination, authority, intelligence, and emotional openness. Actors were once called “players”. This not only refers to the performance, but to their ability to keep the moment alive and in play. It can be useful to think of ourselves as “players” as we seek new ways to connect and communicate. Actor-training involves developing one’s body and voice and linking them to a rich emotional life and a lively intellect in order to bring an electrical presence to the stage and awaken your listeners’ active attention. You will want to move your audience, convince them, and make them hear what you have to say. Presence depends on freeing physical tensions that inhibit the breathing musculature that is necessary for a connected voice. The work begins with learning a basic actor’s warm-up for the voice and body. Then we focus on the speaking habits that can either support or sabotage your speech. Our workshops use specific texts as examples of interesting language and rhetorical devices to bring structure and intention to your speech – and lastly, you will be coached on the text of your choice. Below is the schedule for a prototype of a day-long workshop, as well as our team’s short-version bios. We are able to tailor our corporate coaching to half-day, or on-going sessions as well. 11:15am – 12:15pm – All together. Bringing text alive - Rhetorical Devices, use of language, creating a tone or atmosphere in your text. 4pm – 5pm – All together. Final feedback to talk over the day and answer any questions that came up in coaching. Andrea Haring is the Executive Director of The Linklater Center for Voice and Language, a Founder of Shakespeare and Company in Lenox, MA, a member of the Labyrinth Theater Company, and has taught on the faculties of Yale School of Drama MFA Acting, Columbia University MFA Acting Program, The New School MFA and BFA Acting Programs and Fordham University Theater. She coaches actors regularly in Broadway and off-Broadway shows, and has an extensive private clientele. In her corporate coaching Andrea has worked with the World Economic Forum Global Fellows, Columbia University Business School’s Senior Executive, and non-profit Senior Leaders workshops, Becton Dickinson and Company, Time Warner Executives, NBC staff, the NYU Law School faculty, Theologians on giving sermons, and for a wide variety of professionals from all sectors of industry who want to speak with clear, authentic and expressive voices. Benjamin Moore is a Designated Linklater Voice Teacher, and is currently on faculty at Hunter College and with The Linklater Center for Voice. He holds an MFA from Carnegie Mellon, a Diploma from the Moscow Art Theatre School. A former dean of the School of Visual and Performing Arts at LIU Post, Benjamin has taught and performed at various theatres and schools throughout Europe and America, including the Moscow Art Theatre, Okolo, Bricolage, Quantum, American Studio Theatre, and the Russian Theatre Workshop. Recent roles include Macbeth, Bolingbroke, and Leontes for Apollo Performing Arts. He coaches regularly with clients at the United Nations. 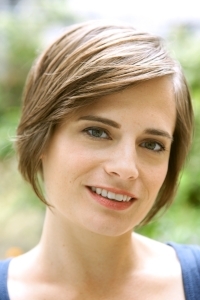 Liz Eckert is a New York based acting teacher specializing in the Linklater voice method, and a performer with a background in physically charged ensemble-based theater. Her core values as an educator and artist include an interdisciplinary sensibility, collaborative spirit, and respect for the individual demands of student, performer, and creative material. She has worked with Columbia University’s School of the Arts, Columbia Business School, The Linklater Center for Voice and Language, Circle in the Square Theatre School, LAByrinth Theater Company, Rattlestick Playwrights Theater, and the World Economic Forum’s Global Fellows Program. Liz finds her creative home with Stolen Chair Theater Company, an ensemble driven group with whom she has collaborated on several productions. Liz is also a seasoned comedian, performing sketch comedy, improvisation, and stand-up.